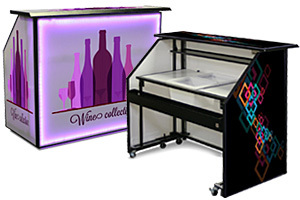 Looking for new supplies to spruce up your restaurant or commercial fixtures that offer merchandise to customers? Our menu and food displays selection provides everything you would need to market and advertise your business. 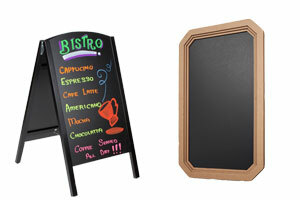 We stock a huge variety of signage, including sidewalk signs, chalkboards, menu covers, and table tents. In the foodservice industry, condiment caddies and drink organizers are necessary food displays that help keep tables and counters neat and sanitary. 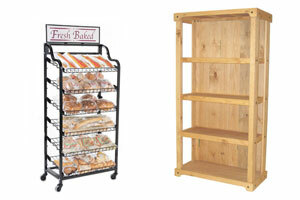 Bakeries and specialty shops require stands, racks, and cases to get their products out in front of shoppers. Moreover, self-serve bins and dispensers that store bulk produce help maintain quality and freshness. 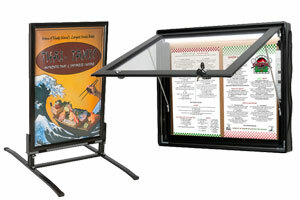 These menu and food displays provide the tools you need for efficiency and professionalism at any level. What can these restaurant supplies do for me? Menu displays come in many forms from floor standing to tabletop. Starting with the exterior-rated signs, sidewalk sandwich boards showcase printed graphics or hand-written messages. They do a fine job of luring passersby into your establishment. 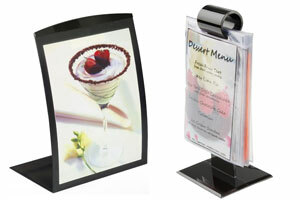 The same can be said for wall mounted menu cases and stands which display your menu for customer perusal. 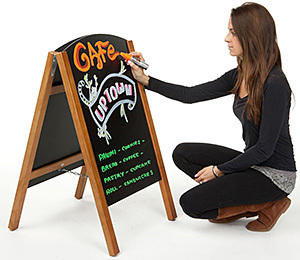 Traditional black chalkboards provide a place to advertise food and drink specials. Since these are hand-written and easily changed, they make great temporary signs that can be used again and again. Digital menu stands are becoming more and more common in today's fine establishments, and we sell a wide range of sizes and styles. 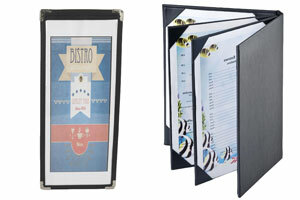 Menu covers, including check presenters, are available in economy clear plastic sleeves and upscale leatherette. Which leads us to table tents, the restaurant workhorse. Small in stature but big in impact, these bar and tabletop sign holders add to your bottom line by upselling patrons with impulse sales. Condiment organizers and baskets eliminate clutter on bar tops and dining tables. Not only do they store small items in one convenient place, they also make them easy to transport thanks to the convenient carrying handle. 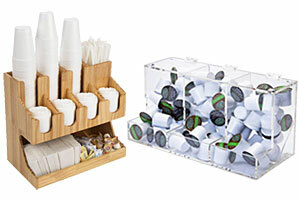 Dispensers hold all kinds of food and beverage supplies, including cups and lids, straws, sugars, napkins, and flatware. They come in two styles: black wire frame construction and black ABS, a tough and rugged plastic perfect for public use. 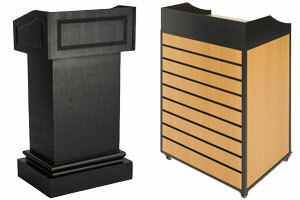 Rounding out the collection are hostess stands, table skirts and linens, and serving trays. 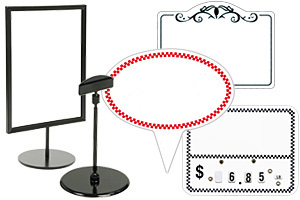 What kinds of merchandising displays are available? 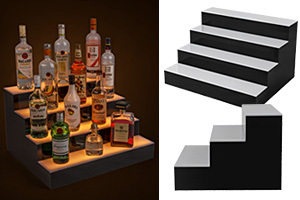 Stands and risers elevate products for a more attractive presentation, whether on tables or countertops. 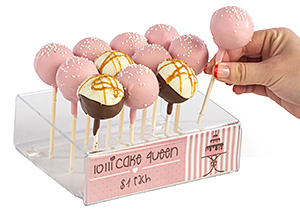 Able to highlight a small grouping of items like cake pops or multiple levels of food, these affordable displays are excellent choices for specialty stores like bakeries and candy shops. Caterers also make good use of these in wedding receptions and corporate functions. For more display ideas, read our "how to set up a buffet" guide. 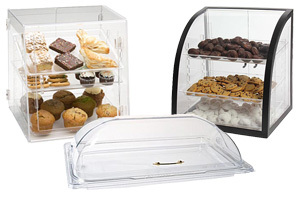 Acrylic display cases are designed to store baked goods like cookies, muffins, and bagels for either employee service (rear access) or self service (front access). We also sell a nice variety of cake pedestals with domes. 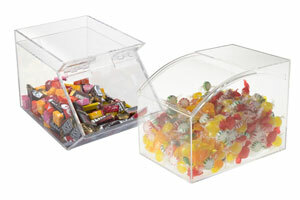 Plastic bins with scoops hold bulk produce like candy and dried fruit. 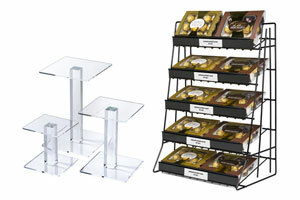 Many models are stackable, providing ample storage space in a small area. 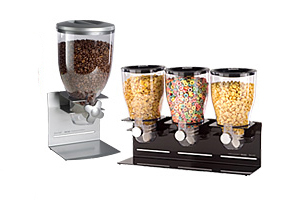 Gravity dispensers with pull down handles are the better answer for many types of bulk items, dispensing coffee beans, cereals, pasta, and nuts. Widely used in supermarkets and health food stores, gravity bins stay sealed to lock in freshness. Beverage dispensers come in many forms; shop from pitchers, buffet-style hot or cold containers, as well as coffee airpots and carafes. 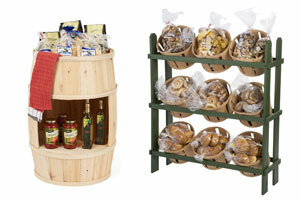 Merchandising stands and racks are perfect for displaying bread, wine, or wrapped bulk produce. Available in wood, wicker and wire, and tubular steel in many styles, these fixtures come in floor-standing and countertop models. The tubular steel racks feature rolling casters for easy mobility. 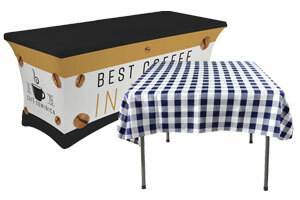 Displays2go sells a great many products for food marketing and advertising. Take the time to browse our varied categories to find the best fit for you and your business. It doesn't matter if you operate a pub or health food store, we have the food merchandising displays you have been searching for. Most items are stocked for same day shipment when purchased before 3PM EST.